These super lightweight stereo headphones feature a slim, adjustable headband for a perfectly comfortable fit. The product has small, black sponge ear pads and a 1.2m lead for convenience of use. The 3.5mm stereo jack plug means that these headphones are ideal for use with most standard devices, including Smartphones, MP3 Players, iPods/iPhones/iPads etc. 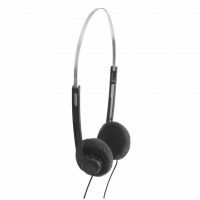 These affordable headphones are ideal for educational/tour company or home use.